Eight years ago, Linda Bales needed an escape. Having relocated to Nebraska, Bales spent her days caring for a mother-in-law who suffered a series of strokes and a retired-military husband hampered by alcoholism. Then a friend mentioned a possible job driving a bus around UNL. Bales had maintained her CDL after driving a tour bus on the East Coast and a school bus at Fort Bragg. Shuttling students, faculty and staff between UNL’s City and East campuses sounded pretty good. She jumped at the opportunity. She started as one of Transit Services’ on-call drivers. The hours varied, but that was OK.
“Sometimes I was here first thing in the morning. Other times I came in late at night. Whatever was needed I was there,” Bales said. “The time didn’t matter to me. Just getting out helped so much. It kept me from self-imploding. And Bales has worked hard to give back to the university. Driving the intercampus bus route, Bales welcomes passengers with a smile and a warm greeting at every stop. As passengers depart, she wishes each a great day. During Halloween, Bales makes popcorn balls for her passengers. At Christmas time, she bakes cookies and hands them out. She’s also quick to strike up conversation — especially with students. One of her favorite things is to discuss recipes — particularly with international students, faculty and staff. If she doesn’t know the recipe, Bales will track it down. In March, Bales would have worked at UNL for eight years. 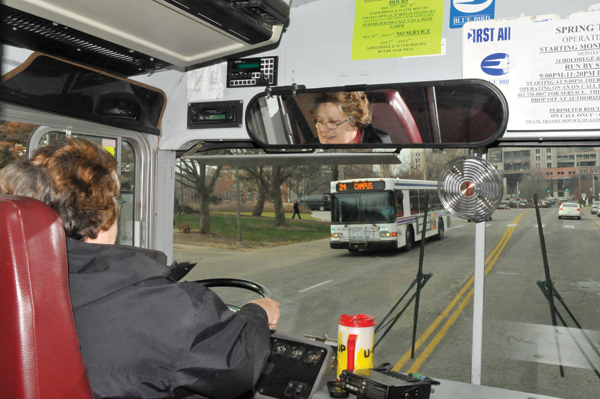 However, she is one of four intercampus bus drivers losing jobs as UNL transfers route management to StarTran (read more here). Now, she is eight days away from her last shift on campus. Bales has a hard time talking about the change. She expects to be lost for a few days after it happens and might even come back and deliver baked goods to her bosses (who she still adores). But Bales is not bitter. Instead, she’s eager to move on to her next stage of life. Bales and her husband plan to venture to Kentucky in April in a travel trailer and manage a campground. Bales also plans to learn everything she can about community food distribution networks in the region. She said those networks are special in that they often distribute fresh fruits and vegetables to those in need. And, when Bales returns back to Nebraska, she hopes to take those lessons and implement them here — possibly out in the more rural areas of western Nebraska. “I’m also writing up a presentation to establish a senior citizen calling tree here in Nebraska,” said Bales. “That is something they have in North Carolina and it’s a great way for senior citizens who are home alone to develop phone friendships while also checking up on each other. But, before she can move forward with those projects, Bales still has a job to do. And it’s one she’s going to enjoy right up to that final route on Dec. 21.